Nerve compression syndrome or compression neuropathy is a medical condition whereby a focal nerve lesion is produced due to sustained pressure on that particular nerve. It’s also known as entrapped neuropathy wherein the pressure could be exerted from an external or an internal source. It usually occurs at one particular joint area and can lead to excruciating pain, sometimes resulting in nerve damage and eventual muscle wasting if left untreated. The most commonly involved nerves in compression neuropathy include the carpal, peroneal, radial and the ulnar nerves. Nerve entrapment typically produces symptoms of muscle weakness, pain, burning sensation, tingling and numbness or even paralysis. 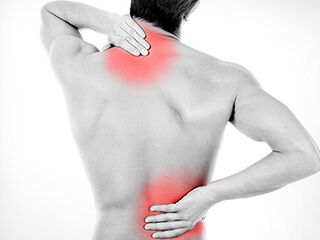 The symptoms affect just that part of the body which is supported by the trapped nerve. Pressure reduces the flow of blood in vessels nourishing the nerve, leading to a local ischaemia, thereby affecting the function of the nerve, and eventually leading to damage to the covering sheath of the nerve (demyelination) and finally, scarring. Common forms of compression neuropathies include carpal tunnel syndrome, where the wrist along with the thumb, index and middle finger are involved and the cubital tunnel syndrome where the elbow is involved, causing hand weakness and pain in the wrist and the ring and pinky fingers. Other forms of nerve compression neuropathy syndrome include peroneal neuropathy which affects the knees and the tarsal tunnel syndrome which leads to altered feelings in the foot and toes resulting in numbness and tingling and weakness of the foot muscles. The Handlebar Palsy is another form of compression neuropathy, commonly experienced by long-distance cyclists; the prolonged periods of direct pressure on the ulnar nerve in the wrist with the weight of the upper part of the body bearing on the handlebars, leads to the aptly-named handlebar palsy. Amongst all types of nerve injuries, compression neuropathies are considered to be the commonest and often time result in microvascular changes leading to swelling and inflammation of the surrounding tissue or structures, thereby reducing space within the area and resulting in nerve compression. In other instances, the injury could be caused by outside mechanical forces or due to pathological changes like tumors or cysts. Diagnosis of compression neuropathy is easy when it’s due to external injuries, but lack of a physical trauma can make it difficult to find the reason behind the excruciating pain and tingling. Physical examinations along with the Tinel’s and Phalen’s tests are helpful in diagnosing conditions of compression neuropathy. Some other imaging tests that are useful include X-rays, MRI and Nerve Conduction Velocity (NCV) studies. The underlying medical cause of the nerve compression has to be treated first, and in cases where there is no underlying medical condition, then surgery is the next option to relieve pressure on the compressed nerve after proper diagnosis. Sadly, complete recovery from symptoms isn’t always possible in some chronic cases, even after surgery.